WHICH BACTERIA ARE PROVIDED IN VSL#3®? VSL#3® contains high concentrations of 8 different bacterial strains. 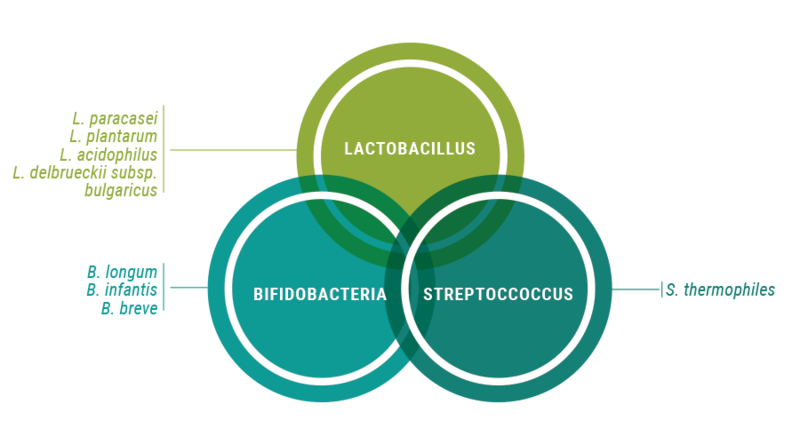 These strains can be classified into 3 families of bacteria: Lactobacillus, Bifidobacteria and Streptoccoccus. The specific 8 bacterial strains include: L. paracasei, L. plantarum, L. acidophilus, L. delbrueckii subsp. bulgaricus, B. longum, B. infantis, B. breve, S. thermophiles. VSL#3® contains 450 billion live bacteria. The bacterial formulation is free of allergens such as soy, gluten and lactose. Other ingredients may include corn starch, maltose and silicon dioxide. 1. Store VSL#3® in the refrigerator in order to protect the viability of the microorganisms. 2. Mix the contents with cold or room temperature food or with non-carbonated drinks. 3. VSL#3® can be taken at any time of day (up to 4 sachets per day).